""Hi my name is Gail and I am 45 years old. I work for the North East Ambulance Service and have just received my long service award for working with them for 25 years. I have always been interested in exercise and sport and have attended numerous gym sessions and exercise classes over the years. When I lived in Wallsend I was doing the washing up one day and I saw a group of ladies running past my kitchen window. I decided to find out more about them and that’s when I found These Girls Can Run. I did do a little bit of running myself but I liked the idea of running with a group as it’s safer and also it can get a bit lonely when you are running alone. I joined the Wallsend group of TGCR and enjoyed the friendship and camaraderie immensely. I found the group atmosphere very enjoyable and the support and encouragement I got from the group leader and other members was fantastic. When my marriage began to break down I found running to be very therapeutic and it helped me gain confidence during this difficult time. I recently moved back to Bedlington and joined the Cramlington group of TGCR as it was more convenient for me to get there. I found this group to be just as supportive and made some very good friends there too and that’s when I decided I wanted to be a Run Group Leader and run my own TGCR group. 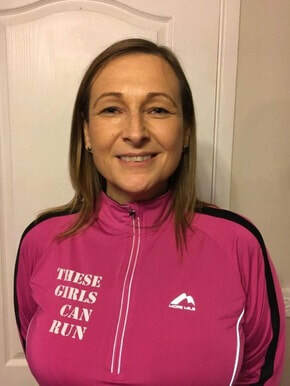 I would like others to experience the way running can help with stress, and other problems especially when you run as part of a supportive group. I can’t wait to help and encourage others to enjoy running just like I do!"